“Where Do I Get My Morality From?” This question simply doesn’t seem to suffice. It doesn’t get to the crux of the matter. I think the questions that would be better suited are “what is the foundation of our morality” and even more importantly, “how do we develop our morality?” In this blog I’ll attempt to briefly summarize my argument as this topic could easily take several books to cover. Here I argue that a secular moral framework is the only way to understand and develop a proper moral system. Whereas religion (or God as the argument goes) not only cannot provide the foundation for morality, but actually undermines it. Broadly speaking, morality has a naturalistic foundation as we evolved as a social species that can reason. And how we develop our morality is from the recognition and reasoned reflection of the human condition we find ourselves in and the states of affairs that affect it. It is the critical analysis of the various data that inform us about the correct and incorrect actions that affect the current state of affairs in such a way that is most conducive to human flourishing, thus improving the overall human condition. Then we implement these principles in everyday human interaction, so much so that they can become character traits. This is then in turn passed on to the next generation. Our actions have positive and/or negative effects on other people. And by extension, these actions affect or create states of affairs that are either beneficial or detrimental to well being, societal health, etc. that are necessary conditions for overall human flourishing. This is an objective moral fact and what we mean when we speak of “morality”. Now a common objection to this is to say that there’s no “authority” from preventing me from doing otherwise, that may be, but we have a word for that… it’s called “immoral”. To suggest that “torturing for fun is moral” is a nonsensical statement. The word “moral” has a specific usage (which I outlined above). It’s this basis of what we mean when we say “moral”. It’s also how we can judge acts and ideologies (such as religion) as “immoral” as they don’t conform to any sense of the term properly applied. Another common objection isn’t really an objection at all, and that is to ask “why should I care about human flourishing?” But this is a different question than what we are addressing here. However, this question when applied to religious morality does expose the real nature of the religious moral framework as being a self-serving consequentialism. Because when we pose the question to the believer, the answer is typically along the lines of “because God knows what’s best for us” or “this is God’s moral law” and by following these laws there are rewards and disobeying these laws result in consequences. Whether the consequence for disobeying God is eternal torment in Hell, the complete annihilation of the soul, or simply not being in God’s presence and experiencing him. This shallow, self-serving consequentialism is ultimately predicated on blind obedience and thus an abandonment of our rational faculties. It destroys the very foundation of ethics and the means in which we develop them. It provides a cheap and hollow understanding of morality that doesn’t provide a means to get to the core of the issues and cuts us off from delving deeper. And this deficiency of religious morality is revealed when we attempt to apply it to real world moral problems we face today. Religion, being an authoritarian ideology (and the most widespread and thus influential), lends itself to the forming of beliefs that have metastasized in some of the most evil acts imaginable. It’s primary fault is the psychological consequences of the beliefs it fosters. It gives justification for attitudes and worldviews that often result in actions that are detrimental and corrosive to any civilized, modern society and on a global scale. Given this, the believer can no longer make any moral judgments beyond “what did god command” or “is this in accordance with God’s nature”. Within a religious framework, we are left without the ability to weigh “goodness” against other “goodness” or “evil” against other “evil” as these terms no longer have a demonstrable foundation in humanity. Good and evil become an outside standard that you cannot participate in, only obey. When I use terms like “moral” and “ethics”, I am talking about something of substance, something demonstrable. Religion can’t make even this most basic of claims about morality. Whereas religion destroys the very foundation of morality and thus results in a deficient and shallow ethical system, a secular moral philosophy grounded in humanistic principles and informed by science provides us with a robust moral system with the ability to grow and develop as our understanding grows and develops. It provides the solid foundation necessary to make proper moral judgments and not a system of simply following “laws”. This makes it the only viable moral framework and eliminates the faith-based religious framework from contention. I take it as my duty to challenge such ideology as it undermines morality, and morality is arguably the most important topic we as humans need to understand if we are to continue to progress towards a better future for all of humanity, here now and for generations to come. I will use our instead of I as our refers to an objective standard that would apply to every human universally, whereas I would simply be referring to the subjective acceptance (or not) of this standard. There have been many variations on punishment as apologists have been attempting to reconcile the concept of an eternal Hell with a supposedly omni-benevolent God. The argument isn’t about whether religion once was wholly beneficial to developing a society (which I reject) or not. Only that we see the problems that arise in today’s societies. 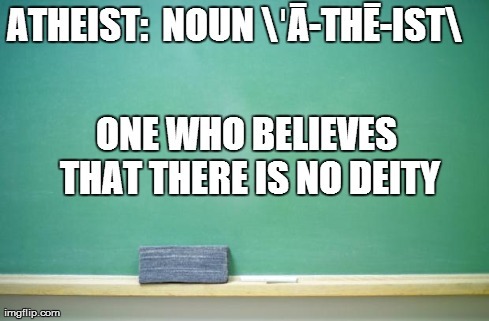 When it comes to living an openly secular lifestyle I am often confronted with questions that start out with “Does an Atheist…” or “Do Atheists…”. Of course I have no problem answering any questions that are thrown out to me, but whenever they are prefaced with this type of generalization I make sure that one thing is clear… I cannot speak for all Atheists, I can only speak for myself. Somehow this is frequently met with a bit of confusion, as more and more people are lumping Atheism with religion. People assume that, just like religions have rules that you (are supposed to) live by that Atheists do as well but this is not so. The only thing that all Atheists have in common is a concrete stance that their is no deity directing their life. After that it is up to the individual to decide what type of life they want to live. I know a lot of times people believe that being an Atheist automatically makes you an Anti-theist, this is incorrect. Personally, I have no desire whatsoever to abolish religion. I do not want to take away the rights of anyone to be able to practice as they wish and I am not trying to create a completely secular world. My non-belief is not strengthened just because I can force it onto others and so I am not in favor of doing so. Simply keep it out of my public policy and this Atheist will gladly let you go on your way. Another one that I encounter on a regular basis is that all Atheists are Humanists… again, this is incorrect. I would never pretend that all non-believers are living with humanistic values in place. I am in fact a Humanist, our household is run with a Secular-Humanist system of reasoning and respect. The “golden rule” approach in respect for how to treat others is encouraged by both Rich and myself, but this is not something all Atheists believe in. Ideally everyone, believer or non, would use mutual respect and personal dignity as a foundation … but the rules that come with religion do not allow for it, and the lack of rules that come with being an Atheist do not require it… so we are left with a wide range of right and wrong in our world. The insinuation that only believers can hold seemingly irrational beliefs is possibly the most ridiculous of all. Dismissing the existence of God does not mean that you will not fall victim to the paranormal. I know many Atheists who claim to be “Agnostic” towards ghosts… and I also know some who absolutely believe in aliens. Sometimes if this topic comes up in a discussion group Atheists will start to turn on each other, stating that you cannot believe in the things just as ridiculous as God and still call yourself an Atheist… they are wrong. In fact , as long as God is not a factor you can believe the world is flat and still be a perfectly fine Atheist. So when confronted with questions about what an Atheist does or does not do, try to make it clear that the better question would be, “since you don’t follow a religious belief system, what do you use to guide yourself through life?”. There are no commandments that Atheists abide by and so each one of us must speak for ourselves. At the end of the day there is no right or wrong way to live your life as an Atheist. The only thing that you need is a lack of belief in God, everything else is optional.